Comedy Masala ft. MIKE MERRILL (USA) | as seen on NBC, GABRIEL IGLESIAS STAND-UP REVOLUTION, Comedy Central & CBS | FIRST EVER PERFORMANCE IN SINGAPORE! 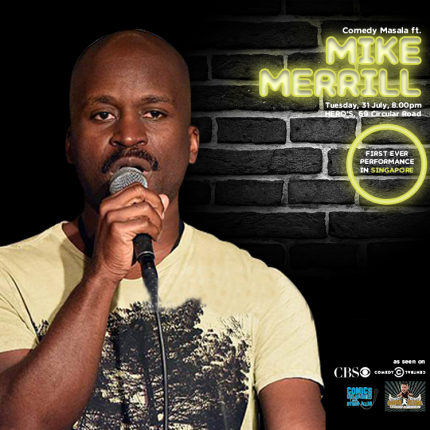 Mike Merrill is a 20 year Stand-Up Comedy veteran who has performed throughout Asia, Africa & Europe. He's had performances on Comedy Central, CBS, NBC's Stand Up for Diversity and has appeared on global media sites including Hulu and Buzzfeed. He brazenly taps into popular culture, relationships, the economy and society. He's written professionally for television and continues to write and produce his own content. Seeing him live, you'll get a hilarious look at life from one of today's most honest and insightful comedians.